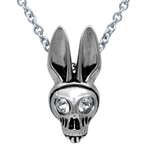 For those with a love for both the cute and cuddly and the macabre and morbid, the Bunny Skull necklace is just for you. Made of 316L stainless steel, the Bunny Skull pendant comes with a choice of 12 birthstones colored Swarovski crystal embedded as the eyes of the skull. You choose which birthstone necklace identify with yourself or for your friends. Pendant Size: W: 0.63" H: 1.42"
January - Garnet, darker red, symbolizes constancy and loyalty. February – Amethyst, purple, symbolizes sincerity and peace. March – Aquamarine, blue, symbolizes courage and health. April – Crystal, clear, symbolized innocence and love. May – Emerald, green, symbolized happiness and fertility. June – Alexandrite, light purple, symbolizes balance and joy. July – Ruby, red, symbolizes nobility and beauty. August – Peridot, light green, symbolizes felicity and protection. December – Zircon, greenish blue, symbolizes wisdom and wealth.